It is the perforation of the tongue web (frenulum), the small flap of tissue that attaches the underneath of the tongue to the floor of the mouth. 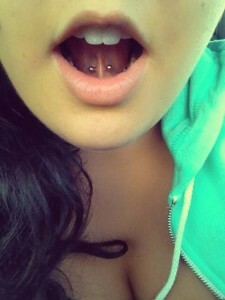 The tongue web piercing is not noticeable unless you lift your tongue. An uncommon style of oral piercing, you can give it a try provided your frenulum is prominent enough. It is also known as frenulum piercing and tongue webbing piercing. Although this piercing is relatively simpler than other types of oral piercings, you might have to search for a well-recognized piercing salon having years of experience in it. Before going ahead with the piercing, you would be given an antibacterial mouthwash for rinsing your mouth. A light, hollow needle is then pushed through the frenulum. A curved or straight jewelry is inserted into the pierced spot after the completion of the procedure. Piercing the delicate tissue layer beneath the tongue could be quite painful. Not many are comfortable with the jewelry sticking out from the tongue web. Do not worry if the pierced area swells or becomes tender as it happens with any piercing. It takes around 2 to 8 weeks for the piercing to heal properly. An infected frenulum piercing can cause irritation and pain along with pus discharge. If the piercing site undergoes severe swelling and reddening then seek immediate medical attention. Although it does not cause damage to the teeth and gums, the jewelry might rub against the underside of the tongue and floor of the mouth, resulting in pain. 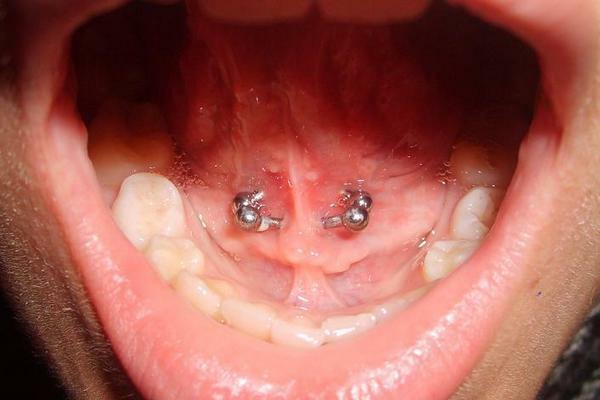 Rejection is another common issue associated with tongue web piercing due to the unusual placement of the jewelry. Therefore, it is necessary to get it done by a certified piercer. Larger-sized steel barbells and ball closure rings are ideal for the piercing. Titanium and gold jewelry are also good options. You can settle for smaller jewelry after the area heals completely. The price of the piercing ranges between $15 and $30 in any sophisticated piercing studio. As the name suggests, two perforations are made on the tongue frenulum. 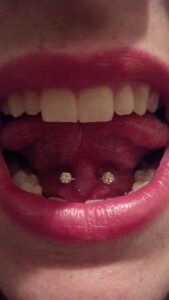 If you have a well-developed tongue web, then three piercings can be done on it. However, this one may cause a greater amount of pain.